Mobile phones.... Tablet PC’s.... Music players....FED UP OF RUNNING OUT OF SOCKETS? You need the revolutionary solution for USB Charging! Upgrade using our USB charging plate in a few simple steps. Instantly creating 2 USB ports allowing you to free up your UK mains sockets for use with other appliances.....an easy swap & you’re set-up for fast USB charging Compatible with all major devices including Samsung & Apple! Designed for items such as Smartphone’s, Music Players, Cameras, Tablets & other devices that require charging via a USB port. Simply plug your USB cable directly into the USB sockets. The 2 Amp combined USB ports are powerful enough to quickly charge a single smartphone, it will swiftly charge two smartphones or similar devices together or charge a Tablet PC with ease. Conforms to BS1363, BS5733, IEC60950-1 and LVD Directive. 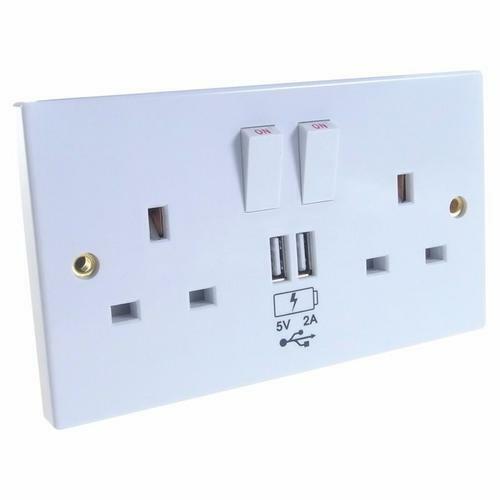 I was replacing an old white socket which has been in the house for a few years and looks quite similar to this design. I decided to buy one with USB's as i had found my sockets were getting bunged up with usb chargers. What a great choice, i've just purchased another 5 for other rooms. recommended to all.